Toronto's Manifesto festival is set to take over the city for another year, and in promising a celebration of community and culture through music, visual art, dance and more, organizers have revealed the headliner for this year's event. 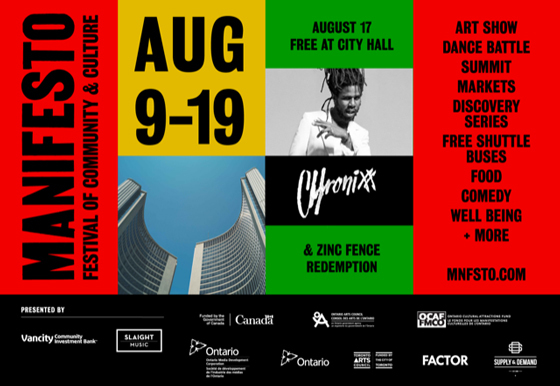 Chronixx and six-piece backing band Zinc Fence Redemption will headline a free show at the city's Nathan Phillips Square on August 17. The event marks a return to the location for the fest, promising expanded festival grounds out front of Toronto's city hall. UPDATE (7/18, 12 p.m. EDT): Charlotte Day Wilson has now also been announced as a co-headliner for the free festival show on August 17. Manifesto's 2018 edition is set to run August 9 to 19. New this year is the Manifesto Discovery Series, running August 9 to 14 in venues and DIY spaces across the city with rising artists and organizations. Further programming information and announcements are set to be made in the coming weeks. You can visit Manifesto's official website here.